Early this year I received a spam email about “The Congressional Reform Act of 2011.” I looked at it and thought that most of it sounded like good suggestions to me, but what were the facts. After a bit of research I found out that FactCheck.org had vetted the email pretty throughly and had done a good job of showing where the original person, who started the email, was uninformed on parts of their Act. While I make no claim to know much about politics, I was interested and decided to look into the parts of the “Act” that FactCheck did not make specific comments about. Specifically Term Limits, Pay Raises and Health Care. What follows are my suggestions from the viewpoint of a past government employee. -U.S Army Infantry, Sniper. The next three sections are self explanatory as I added the comments to the individual sections for the sake of brevity. A legislator collects a salary while in office and receives no pay when they are out of office. They currently can receive up to 80% of their salary after one term, how much they receive depends on many factors. A soldier who serves less than 20 years and does not get injured gets no pension why should our legislatures get better consideration? Pay Raises -Currently they get an automatic raise to match COLA, unless they vote against it. Our legislators will no longer get a COLA (Cost Of Living Allowance) adjustment if the Country in is debt. If Social Security, Armed Forces, and Disabled Veterans do not get it why should they? Our legislators should participate in the same health system as the Military and Veterans since they all work for the same government it only makes sense. Also, this might improve the quality of care and treatment of Veterans in the VA hospitals. I feel that we need to overhaul the system. 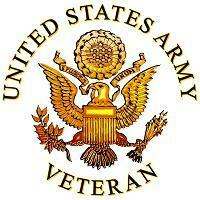 For me it was an honor to serve in the U.S Army and so serving in Congress should be an honor. The Founding Fathers envisioned citizen legislators, so ours should serve their term(s), then go home and back to work. Who are to be the electors of the federal representatives? Not the rich, more than the poor; not the learned, more than the ignorant; not the haughty heirs of distinguished names, more than the humble sons of obscurity and unpropitious fortune. The electors are to be the great body of the people of the United States. This week I was asked to speak on behalf of US UnCut at the Jobs with Justice monthly rally at the James R Thompson Center in Chicago. There were four speakers including Susan Hurley of Jobs with Justice. After the speeches we marched up Lasalle Ave, in a noisy but orderly fashion to the Bank of America where we protested outside the bank for while. Please come out and see us next “First Friday” May 26th 2011. “First Friday” is the first Friday of the month when a number of people give up part of their lunchtime to come downtown, show public solidarity with the nation’s unemployed and underemployed workers. We take action on the “First Friday” of every month because that’s the day the Labor Department releases its report on the previous months’ job creation (or lack thereof). Not to mention it’s fair, practical and just the right thing to do! We gather to demand the following: a federal jobs program, jobless benefits (including health care) for ALL of the unemployed, and making Wall Street pay for it! Next month come out and be seen engaging the public discussing the kind of jobs program the country needs. Comment for Internet TV and radio. Exchange experiences related to job finding and job improvement, and housing, food, and health care issues. Petition lawmakers. Sign up to receive information about future actions. Pick up a sign. Come early, spend some time. Take a stand with our unemployed activists and allies for a federal jobs program so all of our loved ones, friends and neighbors who struggling can get back to work! Please join us to help make common sense more common! For more information, call (312) 738-6161 or send an email to susanh@jwj.org. Also visit the Chicago Job With Justice website to learn more. Yesterday, for the first time in my life I decided to participate in an Civil Action. I did not make this decision lightly! As I dug into the history books in my personal library, watched the news, read the newspapers, and listened to NPR I slowly came to realize that our Nation was under attack; when I joined the Army I swore to defend the Constitution against all enemies, foreign and domestic. Years ago when I took this oath I never once imagined that the domestic enemies would be elected officials and corporations! In my studies I saw that the actions of such people and businesses is widening the gap between the rich and poor and shrinking the middle class and weakening this great Nation. I feel as did William Henry Harrison when in 1840 he said. “I believe and say… that all measures of the government are directed to the purpose of making the rich richer and the poor poorer” it also seems to me that instead of a democratic government the aforementioned people want our current government to become an Oligarchy. 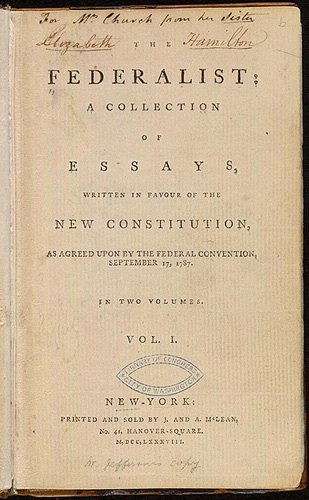 In his book The Republic, Plato defined Oligarchy as “A government resting on a valuation of property, which the rich have power and the poor man is deprived of it.” It seems that the Rich have been greedy throughout history and even though we are 10 years into a new millennium, our society is no better than it was in the far past. Furthermore, all over the world people are rising up, saying “enough is enough” and yet it is falling on deaf ears -unless they have oil-. The people of the United States, too, have been patient long enough, hoping in vain, that those we elected would wake up and put a stop to the long running abuses and despotic behavior. Our patience has run out and time for words has ceased, it is time for action, we must act now to work for the benefit of all Americans, not just the privileged few. Thus I was moved to action, so I acted. I was surprised at all the people at the action. It first started off with two, brave souls, going in and distracting the managers by asking questions about opening an account. Then, people came in with checks that were for 1,500,00.00 (the amount that Bank of America should have paid in taxes) and trying to cash them. When the tellers told them “No” the Uncutter’s gave a quick speech about how the American people were owed this money and that in 2009 Bank of America made 4.2 Billion in profits and paid ZERO taxes to which the tellers seemed speechless about. I personally spoke to two Managers of Bank of America and was told by them that Bank of America “Pays their taxes.” If you combine this with what the tellers said we can draw two conclusions. The Tellers and Managers are lying. The Tellers and Managers do not know what their employers are doing. Either way the American People are hurting and the Truth needs to be told. It seems to me that our current laws are creating a rapid accumulation of property and wealth in a few hands, and thus rendering the rest of the population dependent, poor and hungry. I ask you the following question, “How much are you, and your children, willing to sacrifice so the Rich get richer?” Please get involved in any way you can and at what level you are comfortable with. My next posting will discuss ways you can get involved at various levels. Bank of America refuses to close customer’s account. It seems that todays Action by US UnCut reached at least one person and that person was so moved that they proudly walked into the Bank of America to close her account. But, when she came out of the bank she was in shock and near tears. When asked why? The response was “The manager asked me why I wanted to close my account. I told him it was because Bank of America pays no taxes. The manager then refused to close my account and said if I did not leave he would call the police.” The person has asked that her name not be used but has sworn that she will go to another branch and close her account on Monday. I say that we ALL close our accounts and move our accounts to a Credit Union or a locally owned bank; I will be doing this first thing tomorrow. 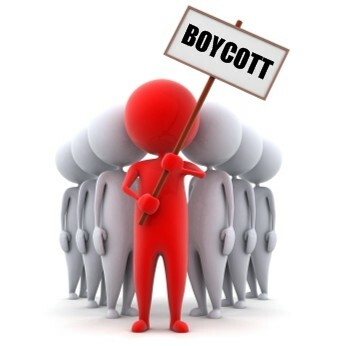 Dr. Martin Luther King and Gandi both taught us to speak “with your money” and they both talked about Boycotts. This is something that we as Americans need to do! I am not asking you to do something that I am not willing to do, I am asking you to do what myself and others are doing, including the Wisconsin Firemen and Policemen, and bring your money back to your local banks, credit unions and savings and loans. It may not seem like much but every dollar you take back is one less they can earn interest on and buy politicians! 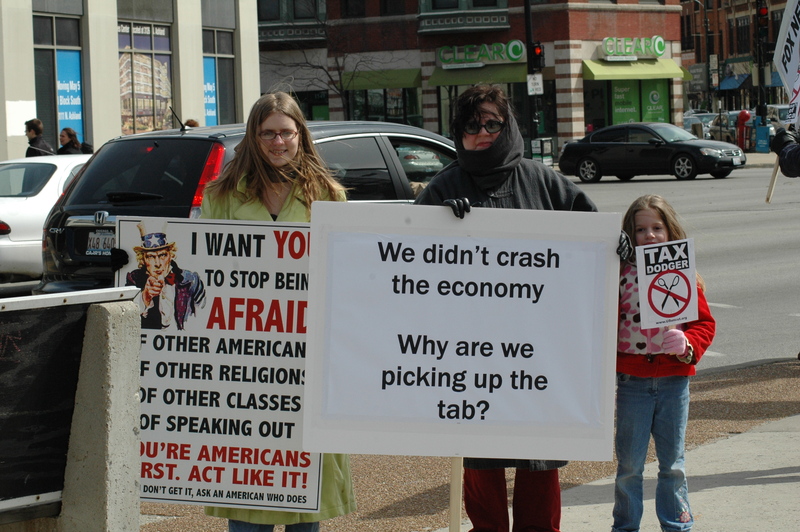 Today I went to the US UnCut Chicago action and took some photo’s. I enjoyed seeing so many people out on such a cold day exercising their First Amendment Right! How to make homemade paints. A few days ago I wrote about how to make sidewalk chalk. After a bit of testing I wanted something that was more vivid in color. Then my daughter smiled at me after drinking her Kool-aid and as I wiped off her little face I realized the answer was staring me in the face. Ahh, Koolaid the high sugar power drink for kids! Now we can use it to power our message that we are mobilizing and taking back our government. Below are three recipes that I tested. * Note I did substitute, Mixade, a less expensive version of Kool-Aid. This recipe makes a very good consistency and makes really vivid colors! I then tried a variation on the corn starch that I used for chalk. This time I added more cornstarch and the Mixade instead of food coloring. Directions: Mix cornstarch and water in a saucepan and stir until mixture thickens. Allow to cool, then add Mixade. This one makes very vivid colors too. Pour corn syrup into bowl. For this one you have to have time for it to dry but it paints very nicely almost like traditional paint. Also be aware that this is sticky! I suggest that you use a small roller with a square bucket for ease of use. Also, if you do use these let me know your results and send photo’s.